Alive n Kicking: A very Denim Story/ Hi, how do you Denim? Note: There is a Secret Message for all Denim lovers at the end of this article. Denims, more specifically, jeans, have taken over the clothing industry faster than any other garment has and are as widely embraced, worn and loved the world over. The classic symbol of the American West is now a staple in wardrobes around the world. From a waiter at a restaurant, to the most influential people in the world, everybody has jeans as an important part of their wardrobe. Have you ever wondered why jeans are so popular? The main reason for their popularity among the people was not only because of the different ways they are worn, but the different and particular styles in which they ‘wear’. The way jeans wear off over time or the way the “age” says a lot about the person wearing them. They have become a common representative for anyone and everyone’s unique personality. 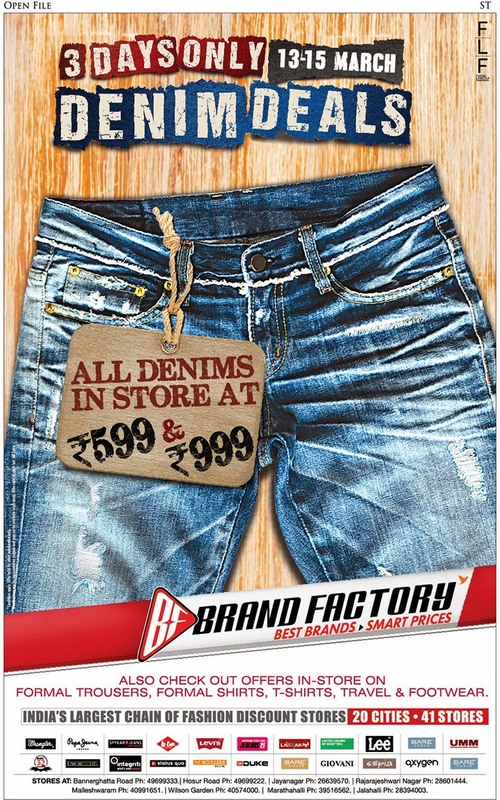 Durable, comfortable and yet stylish enough to always be a part of the latest trends, Jeans are forever. This decade in particular was also popularly known as the “hippie age”. Embroidery, bright colors, stonewash, rhinestones and patches were just some of the jean trends of the time. This decade is when designer denim was truly born. Designer jeans became a true status symbol. Stonewash, acid wash and ripped jeans were some of the most popular looks, along with skinny leg cuts that were tapered at the ankle. Carpenter jeans and Baggy Jeans were among the most trendy looks, as well as overalls, which were popular among women. In the early 2000s, with the rise of pop culture denim also became a fashion staple once again, becoming an appropriate item of clothing to wear out on a Friday night or even to the office. A lot of new styles like skinny jeans and Straight cuts began to trend in a very strong manner. Bell bottoms and Hip huggers are all set to make a remarkable comeback in the spring of 2015. It looks like the 70’s denim culture is ready to spring back to life. We all love our retro side and we know how to pull off the look as well! 1.5 Lakh Branded Pieces on sale. 1- All pieces are available at a flat Rs.599/- & Rs.999/- ONLY. Unbelievable right? 2- The brand list includes a set of 25 denim giants like: Lee & Lee Cooper, Pepe, Wrangler, Levis, Wrangler, Flying Machine, Spykar and many more! 3- Rs.2499 is now Rs.999. 4- Rs.1299 is now Rs.599. 5- If the prices weren’t ridiculous already, you can avail additional offer claims on Facebook and the BRAND FACTORY site!! 6- You have a window of 3 days. Make it count. Everything comes at a price. At brand factory, for three days, that price happens to be under a thousand bucks!